This is the most complete change methodology we have found anywhere." In these turbulent times, competent change leadership is a most coveted leadership skill, and savvy change consultants are becoming trusted participants at the board table. For both leaders and consultants, knowing how to navigate the complexities of organization transformation is fast becoming the key to a successful career. This second edition of the author?s landmark book is the king of all ?how-to? books on change. It provides a strategic overview of the author?s proven change process methodology, as well as pragmatic guidance and tools for each key step in a complex transformational change process. The Change Leader?s Roadmap is the most comprehensive guide available for building transformational change strategy and designing and implementing successful transformation. Based on thirty years of action research with Fortune 500 companies, government agencies, the military, and large non-profit global organizations. The new edition also includes new activities, methods for building change capability, guiding principles for change, and advice for leading the human dynamics in change and creating an organizational vision. This book is specifically written for leaders, project managers, OD practitioners, change practitioners, and consultants seeking greater change results. DEAN ANDERSON is co-founder and president of Being First, a change leadership development and transformational change consulting firm. He is a powerful speaker, writer, coach, consultant and master trainer. Anderson's client list includes Fortune 1000 companies such as Microsoft Corporation, PeaceHealth, Servus Credit Union, Canadian Park Service, Detroit Edison, DTE Energy, Exxon, Cincinnati Gas and Electric, City of Calgary, The Clorox Company, Holiday Inns, United Way of America, Home Savings of America, Levis Strauss, People's Gas, and RR Donnelley and Sons. 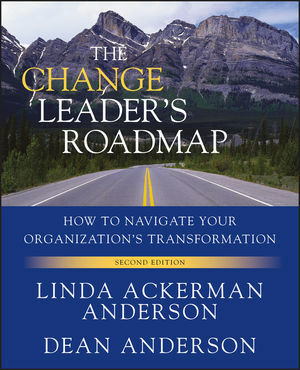 He co-authored with Linda Ackerman Anderson of Beyond Change Management and Change Leader's Roadmap. He has published over 50 articles and has been featured in Business Week, and regularly publishes in Warren Bennis's Leadership Excellence periodical. He resides in Durango, CO.
LINDA ACKERMAN ANDERSON is a co-founder and vice-president of Being First. She specializes in planning for and facilitating transformational change in Fortune 1000 businesses and the military. Linda has spoken about her work on conscious transformation at national and international conferences, and is known as a thought leader and inspiring model of her message. During the past 25 years, her practice has focused on strategy development for major organizational change using Being First's renown nine-phase Change Leader's Roadmap. She resides in Durango, CO.
Change Leaders Network The Change Leader's Network is a worldwide group of change leaders and consultants devoted to exploring, sharing and furthering the discipline of conscious change leadership.